1) This paper was prepared and presented for the first time in session MKTl: Potential and Challenges for Land Markets at the FIG and World Bank Conference on Land Governance in Support of the MDGs: Responding to New Challenges, Washington DC, USA, 9-10 March 2009. Key words: land markets, property, administrative systems. The design of land administration systems needed to support land markets now benefits from the broader theoretical framework of the discipline. The arrival of new “tool box” approaches has also enriched our capacity to design systems that work despite the diversity of national approaches and experiences. 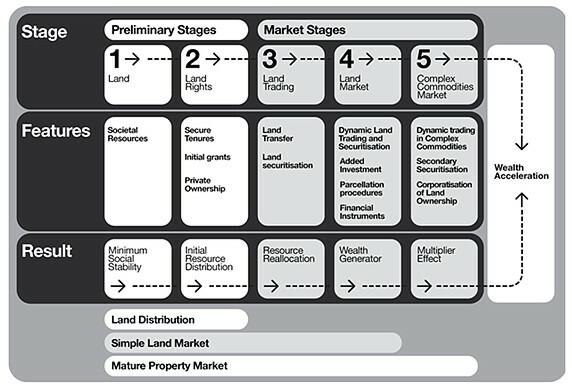 The central feature of land markets is the concept of property. The concept is cerebral, conceptual and divorced from physical reality: this is both its challenge and its weakness. The property concept appears at an early stage in development of land markets but is not well understood. Despite popular thinking, design of land administration systems for land market operations does not revolve around managing land. Rather the design revolves around management of this abstract and cerebral concept, with management of land itself as an essential but secondary function. An analysis of the stages of development of systems of market administration can help explain how markets develop abstract concepts into commodities. The stages can help national implementation of pro-market systems without sacrificing pro-poor initiatives. Sensible administration should deliver a balanced concept of property that fits both the way the local people think about their land and the capacity of their government to manage systems. Designers of administration systems that support land markets work must understand how these markets work and how administrative frameworks might manage essential trading processes. This is not economics but the practical world of managing both the obvious and the hidden processes that people use to trade in land-based commodities. Though we can debate the boundaries of these numbers, of the 200 or so national jurisdictions, only about 35 offer transparent management of all the basic processes involved in their land markets. The 35 are roughly equivalent to OECD members and the liberal democracies of Western capitalism. Even these 35 experience constant reifications of their systems as they adjust to evasions, frauds, dysfunctions and maladjustments that constantly occur. Witness the sub-prime mortgage crisis in 2008 in the US, and its consequences through out the globe in 2009. For this lucky 35, and indeed for the rest of the world, management of land market processes is getting more difficult. All markets require commodities and trading systems. From a land administration perspective, management of land market processes is complicated and cannot be based solely on the assumption that land markets are fundamentally about land as a commodity. In mature land markets commodities are much more interesting than most analysts realize. These land-related commodities have two aspects. The popular aspect is the visible and tangible – the houses and land, the farms, factories and raw development sites. In short, the physical land. The analysis of the physical aspect of land markets is extensive. These tangible “things” are popularly thought of as the commodities, with land administration consequently concerned about their management. Eventually, this popular approach will restrict the development of land markets by impeding development of a property concept that allows land markets to develop complex commodities. The second aspect is abstract but no less a reality – it exists however in peoples’ minds. In successful market systems the commodities are abstract interests and rights. Their essential nature is not the objects to which they relate but the way systems manage relationships among people in relation to those objects (Cohen 1954). The administrative systems define the cognitive identity of the interests so they can be managed and traded. This cognitive aspect is in fact far more important than the tangible aspects of land in any community in that it delivers the capacity to use land to accelerate wealth. The fundamental challenge for land market analysts and designers of land administration systems is management of these transcendental aspects of commodities. The primary commodity is the land right and its supporting aspects of transferability, knowability, title and tenure which together should deliver comprehensive and predictable access to opportunities to derive wealth out of land-related interests and to manage these opportunities according to sustainable development objectives. In market based systems, access to and regulation of land is designed to institutionalize a concept of property on a national scale (North 1990). Land administration is a new discipline which applies an engineering approach to building systems that support land management and land markets. The engineering approach has notable features. It relies on tools to manage essential processes and functions, and tests their performance to continually improve them. The disciplinary vision of land administration is now extensive and focuses on land management as a paradigm (Stig Enemark 2006). In this paradigm, the key processes are those associated with four fundamental functions in land management: land value, land tenure, land use and land development. Every settled society undertakes these functions. Some use processes that develop accidentally. Others rely on highly planned and sophisticated processes. Successful land markets demand well run processes because they build exceedingly complex concepts of property. Land administration has changed dramatically since it emerged after World War II from its more ancient historical antecedents. Figure 1 below shows the development trends in the discipline, particularly its emergence from its technical constraints into a multi-faceted discipline with adaptable boundaries and best practice models that emphasise overall good governance, participation and sustainable development. These models increasingly rely on remarkable new technologies, and robust theories of property. The technical focus of modern land administration remains important in countries with successful land markets. Figure 2 below illustrates how these countries generate complicated land arrangements and concepts that they initially define as pure information. The technical approach is required to manage information, then convert information into data to support strategic activities for modern governments, businesses and societies. The engineering paradigm required a pragmatic approach to designing, constructing and managing these information systems. But it in mid 1990s it was apparent that a focus on land information was not enough. Meanwhile technological capacity exploded through spatial enablement of systems. 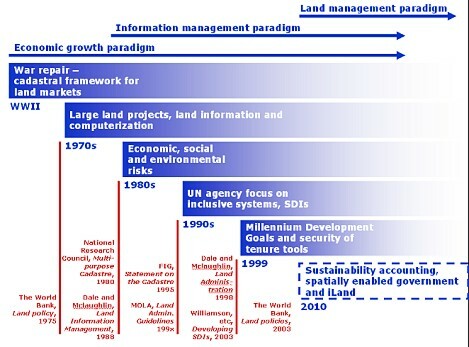 The land management paradigm allowed a focus on planning and development for sustainability to come to the forefront at the stage when information is collected and systems are designed. Modern land administration systems are now required implement processes that deliver sustainability, rather than provide information to government policy makers so they can take this responsibility. Methodologies vary, but always involve implementation of a set of formally organized tools that perform processes essential in land markets and land policy implementation. The tools, and the options available to implement them, also vary and are increasingly examined as a theoretical set or suite. Among the many suggestions, three examples are notable. These are the traditional tools of Geomatics, together with specialist professional areas of valuation, planning and business administration. In some countries all of these fall naturally under the heading of land administration, but most countries have separate professional groupings to attend to discrete functions. These traditional tools remain the core of land administration endeavors, though the selection of options actually used is now influenced by the broader considerations of sustainable development, and good governance. The fundamental lesson from the last 40 years of implementation of these specialist tools is that no one solution is capable of being universally used. The “one size fits all” solution, even in boundary establishment and recognition, does not work. Now land administration experts design their solutions for a country’s land administration requirements in the context of its existing conditions, competencies and practices. 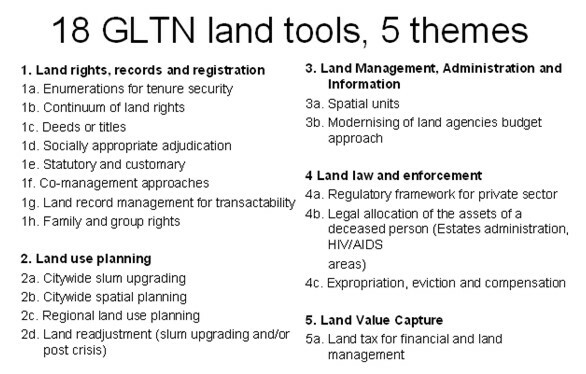 b) The 18 land management tools of Global Land Tools Network of UN HABITAT in Figure 3 below. The GLTN suite of tools is designed to service pro-poor land needs, not land markets per se. However, the tools are essential in pro-market systems in developing countries where numbers of poor people and land pressures over arch land policy and institutionalization of land arrangements. 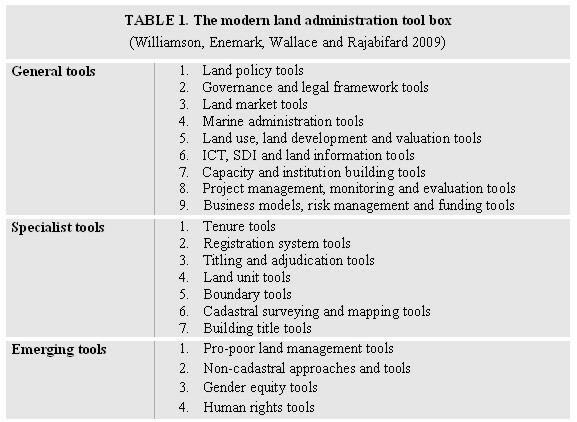 This set of tools in Table 1 above builds on traditional land administration thinking, and takes a long range view to setting up sustainable systems of administration, implementing social, economic and environmental land management, and retaining sufficient flexibility to utilize the newest appropriate technologies if and when they appear. This increasing use of tools, seen also in the parallel attempts to institutionalize good governance standards in national administration, is happily called “the toolbox approach”. The toolbox idea is both fertile and easy to understand. Toolboxes needed for modern land management share one thing. While they do not demand a market approach be adopted for land distribution, they do demand all decision-makers appreciate the difficulties and the challenges involved in establishing systems to manage ordinary processes related to local land. These three tool boxes acknowledge that land markets involve processes that must be managed and seek to move management from informal systems to formal sectors of government. They all emphasise the fundamental starting points in design of any system are existing public expectations and practices. Thus land administration experts do not suggest that implementation of a tool or a suite of tools will, of itself, deliver national capacity to manage a local land market. To deliver a land market, the tools need to institutionalize a national concept of property in land. This property concept is complicated. But there is really no mystery about it. Communities that understand this concept are ready for a modern land market; others are not. Many previous attempts to introduce markets involved constructing the land administration systems without regard to the society’s capacity or willingness of intended beneficiaries to use or relate to land markets, with unintended and often negative consequences. Institutionalization of property involves a tenure system (legal tools, usually legislation) and a titling system (land measurement, identification and management of transactions: typically through registries and cadastres). Economic operation of land markets also depends on related markets for agricultural products, labor, and money. The inter-relationships between these markets will vary from place-to-place and time-to-time. As we all know, these inter-relationships are often unpredictable. The idea of “passporting” property is a major contribution of Hernandes de Soto (2000) to our understanding of land markets. It led to an assumption that passporting processes suitable for all nations could be designed and implemented through top-down national policy and development aid programs that emulated systems used in successful land market countries. This proved much more difficult for reasons now understood to relate to the need to base administrative or legal reforms on the ideas of land that already operate in nation states, indeed even in small areas within nation states. In short, the institution of property is not transferable by introduction of technical and administrative systems and processes – it must be built by people themselves as they absorb the pressures of their lives and internalize change. Market systems rely on “private property”, an idea which emphasizes only one side of the property function – identification of people with control over interests. However, the property function required articulation of fences around all human behaviour in relation to land and opportunities (Reed 2003). In an ideal world, the property institution would move the fence defining property units (or market commodities) to ensure a balance between the various rights, including the rights of the state, to facilitate land markets, sustainability and land distribution reform. Adequate enforcement of private property would allow people in control of other people’s resources to take only those risks that they would take if they personally owned the resources. And the property institution would incorporate the European, inter-generational model of land exploitation by ensuring that public interests in sustainable development were recognized (Raff 2003). The ultimate justification for private property is the common good and thus the applications of private property must ultimately be socially defensible. Another way of explaining this relies on legal theory. The lawyer’s idea of property is a duality: it allows the owner of property (whether the asset is tangible or intangible) power against all takers, with a co-relative imposition of responsibility to respect this power on all potential takers, including the state. The lawyer therefore requires land administrators to design processes that respect the duality of land rights. Rights always involve someone with power and someone with a duty to respect the power. Whatever the legal theory (natural law, empiricism, American legal realism, legal positivism, critical legal theory, and so on), the duality remains. Thus the land administrator is faced with not just tracking the owner, but with systematically identifying whom in the socio legal order must respond to ownership and how they must respond. Lawyers also differentiate property rights from all other kinds of legal rights: we notionally attach the legal right to the “thing” (which may be abstract – such as a share in a company, or a debt, or freehold ownership). Thus we are able to attach rights to an interest in land irrespective of who owns the parcel and when they obtained their interest. If the right relates to property interests in land, it automatically binds subsequent owners. Thus property rights subsist beyond the immediate parties who created them. Mere contractual rights, by contrast, can be asserted only by the parties to the contract. This is why banks and money lenders want “security” over the land when they lend to home buyers and developers. And why a mortgage system needs to deliver a proprietary right enforceable against all takers of the land beyond the person who obtained the initial loan. Any group of people who organise access to and distribution of their land will use a theory of property. Organisation presupposes a system of rules (Llewellyn 1940). Prior to this, the group will rely on exercise of brute force or power to assert claims to possession. In practical terms, a theory of property used in a nation is fundamentally connected with the heritage of its system of rules, notably its law. For convenience we can divide the world into seven anthropological legal orders or “families”: Chthonic (recycle the World); Talmudic (Perfect Author); Civil Law (Centrality of the person); Islamic (Law of a Later Revelation); Common Law (Ethic of Adjudication); Hindu (The Law as King, but which law; and Asian, (Make it New - with Marx) (Glenn 2004). For land administrators diversity of legal origins poses a massive problem of communication. Our individual familiarity with property theory in our home jurisdiction undermines our ability to interpret the idiosyncrasies of any other property theory. This is compounded by the European influences in colonization shown in Figure 3 below which created two mega families in the world finance, constitutional patterns, and legal orders: the common law or British empire countries, and the civil law countries. Figure 3. 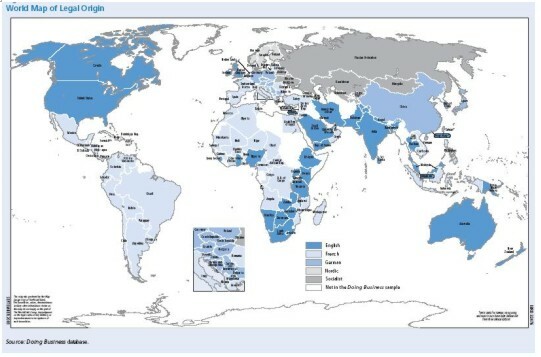 World Bank map of legal origin, p 85. From the land administration perspective, the major issue of servicing land markets revolves around the quite different concepts of land ownership, and hence property in land, in these two dominant legal families. Relative property theory. Common law countries have the benefit of an open-ended and relativistic theory of property. To illustrate (with over-simplification): in Australia, we can have three perfectly sound, legally recognized owners of the same land at the same time. The first is the legal owner (usually the registered owner with a Torrens title). The second is the equitable owner (the person who benefits from the land because the legal owner holds on a trust). The third is the person who has possession of the land – if that person holds on for a 12 (in most states) year period, the legal owner and the equitable owner cannot reclaim the land. English trained lawyers are therefore familiar with having multiple owners each holding a freehold estate in land simultaneously recognized in a complex system of priorities. The system requires complex priorities rules for its daily operation. It is so complicated, that its inventor nation, England, renovated it in 1925 by abolishing all its legal interests except ownership and leases, including mortgages, through reforms that emanated from one of the most conservative parliamentary institution in the world’s history, the House of Lords. Ex colonial nations have tended to preserve the old system in its full glory. In Australia, perhaps the most counter-intuitive result of relative property is the status of most owners of the legal freehold in valuable land. A great deal of commercial, agricultural and industrial land is owned by a legal owner who is a shell: the real owners are the beneficiaries of hidden trusts. The state and the public at large do not know about these trusts. They are not on the public record, and indeed their registration is forbidden. The result is that land markets in these Australian jurisdictions operate without the real owners of most commercial land being on the public register, and without any adverse implications for market operations. This is definitely not a system to be emulated in other countries. However, it illustrates that markets can be both transparent and effective for trading purposes without all important interests being in a public register. The idea of relative property in land also led to another notable consequence: the English law recognizes the estate in land, not the land, as the thing that is owned. Thus a tenant’s home can be burned, but his lease still exists and his rent must still be paid. Flying freeholds (with no “land” at all) were recognized in Australia with ease, in the form of a building extending over a laneway, then in a simple strata title system invented in the 1960s. Condominium owners still own their estates despite destruction of the entire building. In the cut and thrust of a robust property market, the relativities in English influenced systems facilitated a stream of inventiveness that demanded constant change in the legal and administrative systems. Civil law systems. The property system in civil law is different and recognizes a much more absolutist concept of owner, going back to Roman law. Without the relativities, concepts such as trusts which split ownership into two property rights (one legal and one equitable), and then split ownership and management from benefits, must be built by other methods, typically statutory. The concept of land is rigid and recognition of the strata concepts is inhibited (Stoter 2004). In modern land markets the number and nature of property based commodities are unlimited. Since the mid 1990’s, new processes of commodification are especially challenging for land management because they involve “unbundling” land into separate commodities. Opportunities related to the land itself, minerals and petroleum, water, fauna, flora, tradable permits and credits in, for example, carbon credits, dry-land salinity credits, planning opportunities, waste management rights, and so on, are repackaged as tradable assets. The idea comes from using market based instruments (MBI) or incentive instruments for environment and resource management. These initiatives borrow heavily from property theory and from the main characteristics of Western property: exclusivity, duration, quality of title, transferability, divisibility and flexibility. They all require an administrative infrastructure, frequently incorporated into land administration, but sometimes built separately. Analysis of infrastructure needed to manage these commodities to date concentrates on registration, indefeasible title, mortgageability, and compensation for acquisition. Overall, these developments challenge a nation’s capacity to manage land holistically, unless the design of the administrative arrangements and the information generated are related back into LAS and land information. Moreover, little theoretical or practical research is available on how to incorporate social and stewardship values equivalent to the substantial restrictions on land into these new commodities. The land administrator needs to appreciate these fundamental differences in the concept of property in land among these two legal families and to skillfully unpack the threads of historical and social development of any local property theory. The administrator also needs to understand how to build supporting infrastructure to service markets as they develop through stages. 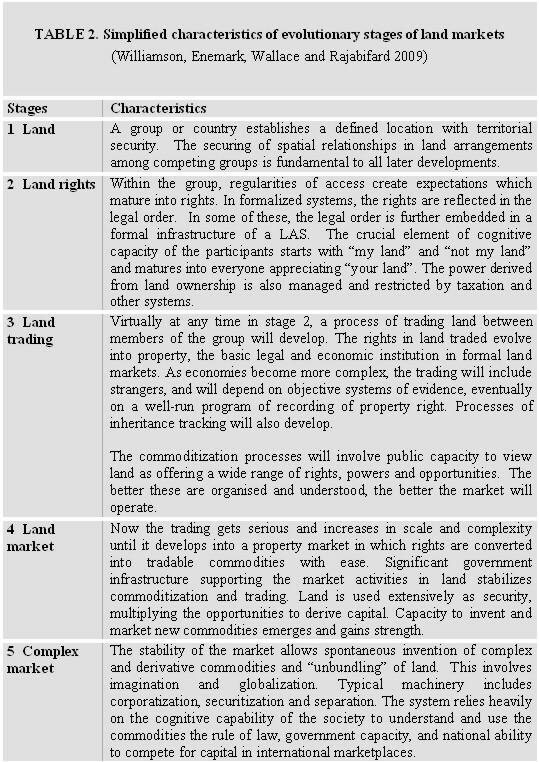 In Figure 4 below, an heuristic (not empirical) set of stages is suggested to facilitate our understanding of the functions that land administration systems need to perform as they mature to meet modern land market needs (Wallace and Williamson 2006). An analysis of these stages is already available (Wallace and Williamson 2006). While markets depend on capacity to define commodities in the form of rights and interests that are recognised as property, processes involved are typically mixed up with land trading and marketing. For a country to achieve a land market, its policy makers must obtain public commitment to the institution of property in land. This involves creating rights and interests that stabilise land distribution and generate capital. While land rights can exist without a market, markets cannot exist without land rights. Tradable land rights are the outcome of the institution of property. Robust land rights and an effective LAS are necessary, though not sufficient, for success in the later market stages. In order to explain these relationships and functions, Table 2 below provides a short introduction to the nature and content of each stage. The important message is to understand that a system needs to be able to move from a passporting land ownership to a passporting system capable of generating complex cognitive commodities on an open-ended basis, hopefully with the degree of regulation that ensures the various interests remain in a socially and economically acceptable balance. 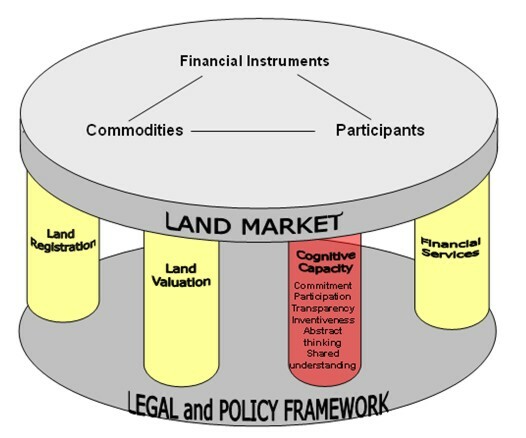 The most significant effort in developing land markets work must be devoted to building the cognitive capacity of the public to understand the market related concept of property (Figure 5 below). This remains essential even in centralist economies (for example, in Vietnam and China) where land remains an asset of the government for the benefit of all citizens. Thus systems that manage land market processes must be built in the context of government commitment to the public, and the co-relative commitment of people to the formal processes. Otherwise they will boycott the formalities. The formal processes must allow public participation, be transparent, allow scope for private inventiveness and inclusion of new commodities. The processes must facilitate abstract thinking and shared understandings of the property model. And all of these must be achieved while respecting local ideas of land and its significance to its users. The demands on land administration systems will continue to grow. Their designers must anticipate sources of disputation and seek to eliminate them, while addressing inevitable failures and disputes. Articulation of public and private roles in relation to land must encourage cooperation and sharing of common goals. Regulation, the rent seekers’ bible, must be limited in favour of creativity and inventiveness. Land administration systems need to be spatially enabled to assist information sharing and streamlining of processes in government, business and society at large. The historical constraints on tenures need to be relaxed so that traditional and modern communal systems are protected within a market context. Land administration theory has evolved to define, if not meet, these issues. And hopefully, the discipline now stands ready to meet the challenges of stabilizing land market process to meet the pressures of global economic recession by preserving and enhancing the social utility of our property institutions. 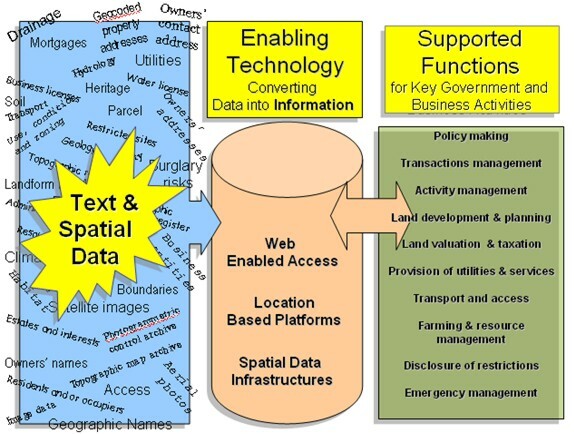 The teamwork of staff and students at the Centre for Spatial Data Infrastructures and Land Administration underlies this paper, particularly Rohan Bennet, Kate Dalrymple and Mohsen Kalantiri (whose PhD theses are on the centre’s website: www.csdila.unimelb.edu.au). Acknowledgment is especially due to my coauthors of a forthcoming book on land administration, Ian Williamson, Stig Enemark and Abbas Rajabifard. Any errors are the fault of the author. Cohen, Felix, 1954, Dialogue on Private Property, 9 Rutgers Law Review 357. De Soto, Hernandes, 2000, The Mystery of Capital. Why Capitalism Triumphs in the West and fails Everywhere else, Bantam Press, London. Enemark, Stig, 2006, The land Management Paradigm for Institutional Development, in Williamson, Ian, Stig Enemark and Jude Wallace (eds), Sustainability and Land Administration, Department of Geomatics, Melbourne. Pp17-30. Glenn, Patrick, 2007, Legal Traditions of the World, Sustainable Developments in Law, 3rd ed. 2007 Oxford University Press, Oxford. North, Douglass. C. 1990. Institutions, Institutional Change and Economic Performance, Cambridge University Press, Cambridge. Raff, M. (2003) Private Property and Environmental Responsibility: A Comparative Study of German Real Property Law, Leiden, The Netherlands: Kluwer Law International. Reed, O. Lee, 2003, Reductionism in Property, Liberty, and Corporate Governance, 36 Vanderbilt Journal of Transnational Law 367. Stoter, Jantine E. 2004, 3DCadastre, Geodetic Commission, The Netherlands. Williamson, Enemark, Wallace and Abbas Rajabifard, 2009 (forthcoming), ESRI Publications, San Diego. Jude Wallace is a land policy lawyer and researcher. She works in international land administration, dealing with systems to deliver social, environmental and economic sustainability. Her policy analysis spans all land tenure types used by the world’s people, all methods of securing access to land and resources and the expanding opportunities created by new technologies. Her research includes designing modern land administration systems for complex property markets, betterment systems for rural land tenures systems, and modeling of processes and transactions associated with social transitions and land markets. Her international consultancy work includes projects in Australia, United Kingdom, Indonesia, East Timor, Vietnam and Iran. As Law Reform Commissioner for Victoria she worked on reforms of land law and administration, mining law, and subdivision law and procedures.